(Optionally) Fetches the Register my Account or Apply for Membership form. Rendering would be the workflow of Window (with no title), Image (aligned to client), Caption (large in Yellow), Timer that calls close in 5,000ms (5 seconds). Both the LOGIN and SPLASH window are displayed, however the Splash is built last, so it appears "on top", and since it is larger than the LOGIN form, you do not see the LOGIN form yet. The 5 second time could be reserved for the server to do a reverse IP lookup on the client's connection, run it through known blacklists, and decide to drop the connection or not. * Note: If the server drops the connection, the client will close all open windows for the session. You should also note, that the client and server can operate in connectionless mode - useful for web browser interfaces too. S: Respond with NOTIFICATION Form (Depending upon SysOp Setting - Greeting Limited Access, or Goodbye until SysOp Verifies you) Another option is system send a validation link to user's email. This is a very simple to use implementation. To avoid problem users, the LIMITED Form does not give the new user many options to execute. Normally a new SysOp starts out with this very basic workflow until he/she gets familiar with all of the features of the BBS. Depending upon the theme of the BBS and the personal goal of the SysOp they may enable a lot of features on the LIMITED or as some do, kick the user off until they manually verify the user. 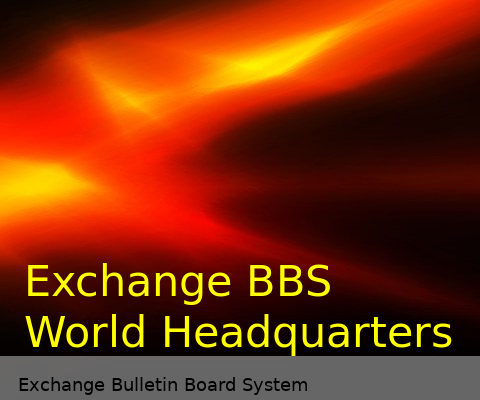 Since we run the WHQ (World Head Quarters) we actually have a "Which BBS Look would you like", and offer a bare basic system for those interested in "What does it look like when I install it? ", then we offer a more robust system for those interested in "What can the software do? ", and lastly, we offer an extremely modified version for those who are interested in "I want it to be different".